It is amazing how very small adjustments to the execution of your baseline out of bounds plays will be the difference between scoring and not scoring. As an example, if we practice the fine details, we are able to score consistently by using extremely simple box plays at the high school level. If we neglect the fine details, we can go for weeks without scoring from the baseline. Then... with just a little attention to detail, it's like flipping a switch. With some fine execution of these extremely basic plays -- you're consistently scoring baskets. If players simply go screen across, then any mediocre defense will stop it. But if you coach, practice, and pay attention to the fine details of the cross screen, you can score buckets (even against solid defenses). The following highlights those fine details. Before the screens are set, the cutters (4 and 2) should fake to the weak side corner to draw the defenders out. Screeners should head hunt and set solid screens. The baseline cutter (4) should blast all the way to the strong side corner to create spacing and flatten out the defense. On the other hand, if the baseline cutter (4) does a shallow cut to the block area, it can ruin spacing and opportunities for other players. The baseline cutter (4) should be a 3pt threat. Not only does this force the defense follow cutter to the corner, but it also forces defense to come out on the initial fake (set up of screen) to the opposite corner. The baseline screener (5) should use good footwork after setting the screen to seal their defender near the basket. The passer (3) should read their defender. If their defender is sagging and taking away the post seal under the basket, don't throw the pass. Look for another option. The top cutter (2) and screener (1) should start high (beyond free throw line) to maintain good spacing. If you let them, the top players will slowly sink closer and closer towards the basket. Don't let them. The top cutter (2) should blast all the way to wing area (staying high) to maintain good spacing. The top screener (1) should pop out to open space after screening. Don't clog up the lane. 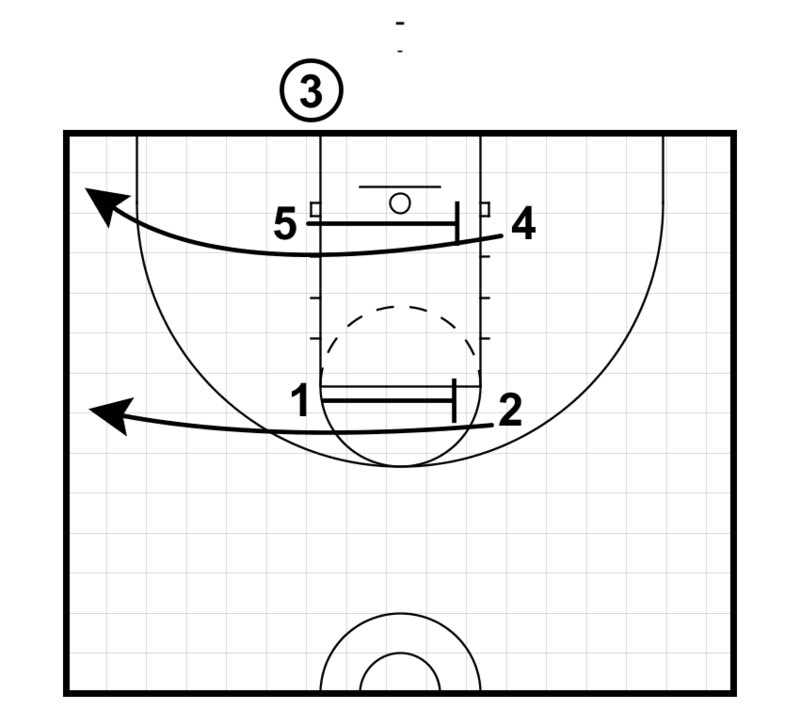 If the ball goes to a top player (2), look for a quick seal inside to the baseline screener (5). He/she could be in good position for a duck in. Players must maintain good spacing on the entry pass for this to work. Consider an "end-out" when the ball goes to the corner or wing. An end-out is a quicker hitter after you enter the ball. Have other counter plays from this same set (box set) so the defense doesn't know what is coming. One or two other box plays is plenty. Just disguise the names and rotate them consistently to keep the defense guessing. By doing so, you'll find a simple cross screen can be quite effective. These key points are what allows you to score points against solid defenses. This might seem like a lot to remember. But if you pick a few plays and get really good at them, players will pick up the fine details. And depending on your level, some of the details might be overkill. A youth coach might be happy if their players just remember where to stand. Where a high school coach may want to implement every single detail listed above. Pay close attention to your spacing at both the beginning and end of your plays. With time, players will slowly shift around and affect spacing. Setting good screens on the correct defender. Often times players will screen air. Players should get in the habit of quickly checking before the play starts to determine who is guarding their teammate. Before screening and cutting, set up your defender. When appropriate, teach players how to read screens (slip, seal, etc) and read the defense. Pay attention to timing. This takes practice and focus. Practice. By practicing the same plays and paying close attention to them, both the players and coaches will learn the fine details needed in order for them to work effectively. Become an expert at a small number of plays. Watch film and pay close attention to the details of a few key plays. Get really good at them.